Sometimes you just gotta get a little silly. 1. a form of entertainment, offered typically by bars and clubs, in which people take turns singing popular songs into a microphone over pre-recorded backing tracks. 2. when someone does something a little strange, or when something is not quite right. 1. add harmony and/or vibrato to your voice. 2. modify your voice to sound like famous singers. 3. display lyrics on the screen of your Clavinova. 4. correct your pitch even when you sing the wrong notes! Karaoke has been around since the ’70s. Love it or hate it, karaoke is quite popular and some people take it very seriously. The problem for me, however, is that I don’t sing (at least not very well). As a result, I have never stood in front of people in a karaoke bar and belted out a song. I’m afraid that if I tried to sing “Yesterday” or “My Way” (two of the most requested karaoke songs), people would laugh. And trust me, they would! Imagine my concern when a karaoke function was added to Clavinovas several generations ago, and I was asked to help introduce this new feature. I was mortified until I came up with an idea: Let me make software where people are supposed to laugh — and call it “Kooky Karaoke”! In its basic form, the Kooky Karaoke software (which works with the CSP Clavinova and any CVP Clavinova model that has a microphone input) retains the essential characteristics of karaoke: You sing into a microphone when you see the highlighted lyrics on the built-in Clavinova screen, while the Clavinova plays along, providing the backing tracks. The Clavinova has several exclusive features (such as voice modification, vocal harmonization, vocal effects and pitch correction) that make this possible. By combining all of these into one “Kooky Karaoke” MIDI file, you can get some amazing results. For example, by using the Clavinova voice modification features, I can make anyone sound like a different person. Even when using your normal voice to talk or sing into the microphone, what comes out is quite different! I experimented for hours and eventually came up with myriad voices like Barry White, Bing Crosby, Shirley Temple, Popeye, the Grinch, the Chipmunks, and Munchkins, to name just a few. To complete the process, Kooky Karaoke includes the backing tracks for famous songs that go along with each voice. 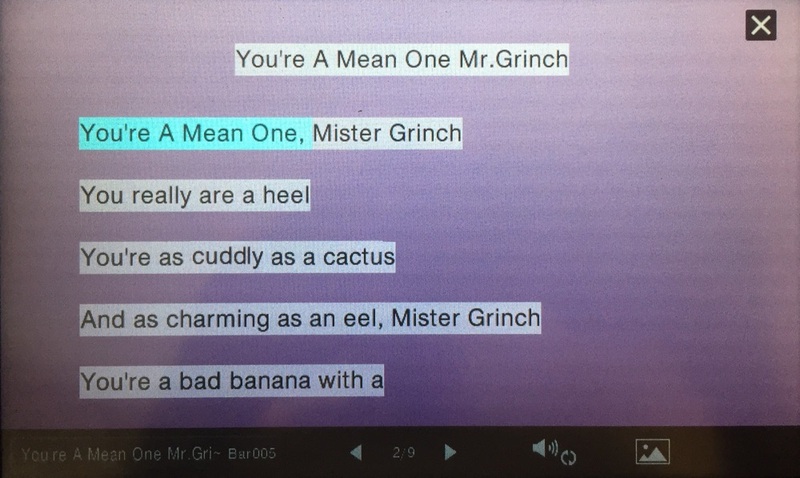 For example, there’s “You Were Always On My Mind” with a Willie Nelson voice, and “How the Grinch Stole Christmas” with a Boris Karloff voice. In addition, Kooky Karaoke can add vibrato to your voice for you — important if, like most untrained singers, you sing with no vibrato. For example, when you play the Kooky Karaoke version of “God Bless America,” you’ll sound remarkably like Kate Smith when the Clavinova automatically adds that huge, wavering deep vibrato characteristic of the singer who was so well-known for her rendition of the Irving Berlin classic. With the CVP-709, Yamaha added a way for the Clavinova to pitch correct your voice, which adds even more functionality to Kooky Karaoke files. This is done by muting your actual “live” voice coming into the microphone and substituting a pitch corrected voice assigned to one of the harmony tracks duplicating the melody. No matter how far you sing out of tune, the Clavinova forces your voice to the pitch of that melody. Four half steps off? No problem! As cool as this feature is, I suggest that you try both pitch-corrected and non-pitch-corrected versions of the Kooky Karaoke songs. I find that sometimes I prefer having complete control of the pitch since it gives me some more freedom to have fun with the silly voice. Other times, I appreciate the help of the pitch correction, which allows me to concentrate on simply singing the right lyrics. How do you use Kooky Karaoke? It’s easy! 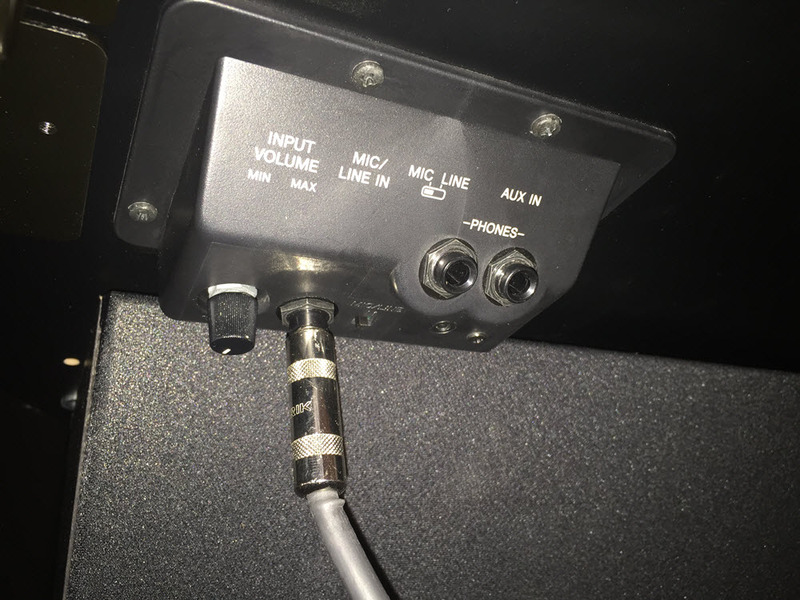 Just plug a microphone into your Clavinova and make sure the switch next to it is set to “MIC,” not “LINE.” (The microphone input and MIC/LINE IN switch are located next to the headphone jacks, under the left portion of the keyboard.) Then slowly turn up the volume as you test the microphone. Select any Kooky Karaoke file to automatically load the special voice modification data without starting the song. I suggest you try out your new voice by simply talking into the mic, so your audience can get to “know” your alter ego before you begin singing the actual song. What type of microphone should I use? Look for a good quality model that has some weight to it and an on-off switch so you can put it down on the bench or music rack and not have it feed back into the Clavinova speakers. It’s also important to choose a mic that is “uni-directional” (as opposed to “omni-directional”) so that it only picks up your voice and not the sounds of the Clavinova (in which case it would try to modify and harmonize those sounds, too!). Where do I get Kooky Karaoke? Begin by purchasing the software and downloading the MIDI files to your computer. Next, move the folder containing the Kooky Karaoke MIDI files to a thumb drive and insert the drive into your Clavinova. Go to the SONG area of the Clavinova and load one of the Kooky Karaoke songs. Then let the fun begin! 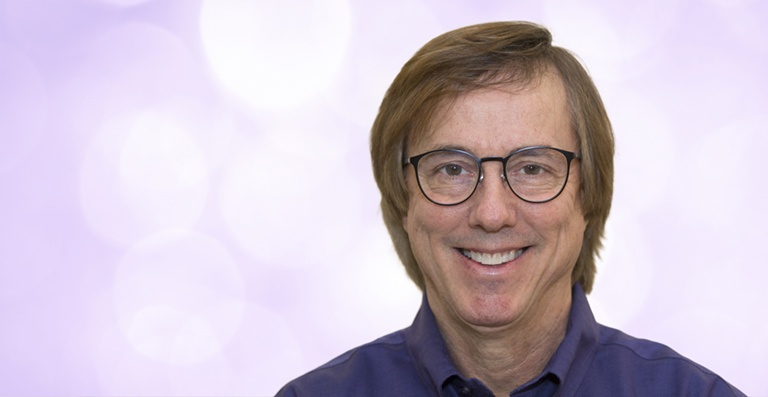 Craig Knudsen has over 30 years experience in the high-tech music industry. He is a highly accomplished keyboardist and musical arranger who has been featured at Carnegie Hall. Known as the creator of “Follow Lights” and “Kooky Karaoke” Clavinovas, as well as SmartKEY on the Disklavier, Craig has designed shows for the Disneyland Tomorrowland’s Home of the Future and has worked with arranger Phillip Keveren to develop the CueTIME Series, where the background arrangements follow as you play at different tempos. Most recently, Craig has worked with ThePianoGuys, helping them create videos featured on YouTube.